This entry was posted in List, War Movie and tagged List, Top 10, War Movies. I agree. Heavily slanted to American. The rest of the world must not have voted. Weird list. I would have assumed it would have been a popularity contest, but some of the movies are not big hits (Hotel Rwanda, The Pianist). If you throw those two out the list makes a lot more sense. As far as which belong, you can make a case for all the others except Braveheart (which belongs in the Bottom 10). I am not as harsh as you. I could see 5 making it onto my 10 Best list. As to the lack of foreign films, I assume most of the voters are Americans and also all the best movies are American. Askmen isn’t a bad list but too American. And no they do not make the better movies, they just focus on story telling while in Europe cinematography was – once at leat – very important. There are US exceptions like Three Kings. It’s quite perfect. Lists are never perfect Caroline…it always depends on people’s preference. But I really can’t agree with Movie war Buff for saying: all the best movies are American << I find more and more Eropean movies are better than American. I’m not sure he was serious although… it could be. I certainly don’t agree. I rarely pay attention to lists like these.They usually just annoy me. Instead I come to this website. A huge portion of the people on Yahoo are going to be American and rarely do Foreign films make it to the US. The last one I can recall that was successful was Pan’s Pan’s Labyrinth. I would guess 99.9% of American simply don’t care about movies outside of Hollywood. Living in the USI feel like I have to hunt down movies down from other parts of the world. I have spent hours trying to track down shows from her home for my Swedish wife. Another problem is that what makes a war movie great to a fan of war movie probable will be different for the casual viewer. And yes while I love the amount of detail and realism in Private Ryan it really does turn into a stupid movie near the end. I do have the feeling as well that most American viewers are not interested in movie from outside of the US and not only because reading subtitles may be a n issue. I wasn’t aware that Pan’s labyrnth was a success in the US. I wonder why. I think it’s an amazing movie but wouldn’t have expected to be liked in non-European countries. I’m gald that we can find almost anything in Europe, be it Swedish or anything else. I totalla agree about Savin Prvate Ryan. The beginning is so stunning but that end was so corny, spoilt the whole film. I’m not sure that ‘war movies’ alone is such a good theme anyway for a list based on group ratings. The scope seems too wide to me. Multiple lists such as ‘combat/ops movie’, ‘war epic’, ‘civilians and war’, ‘war romance’, ‘meditation on war’, ‘war comedy’ etc. would make more sense, and probably bring up terrific yet less publicized films, foreign or domestic. My point exactly and similar to what Casey wrote. Logically when the general viewer votes he is rather for Schindler’s list than for a too combat intense movie. When I satrted this blog any movie which wasn’t a combat movie wasn’t even a war movie in my book. Meanwhile I chngaed the subtitle to my blog to “war movies and war time movies” to be able to expand a bit. Still I think it’s hard to compare sub-genres and it would be much more interesting to make sub-genre lists and maybe, as you said, one could discover something. The hope to discover something, against my better judgement, makes me return to lists anyway. 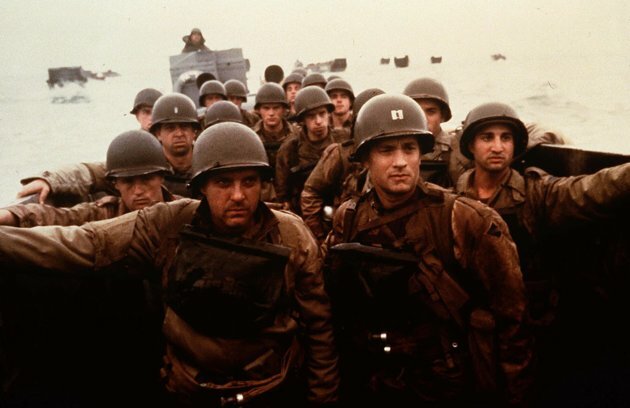 On the other hand, in my view Saving Private Ryan isn’t a very good film, yet I can’t ignore the virtuosity of the Omaha Beach sequence and its influence on other directors (even though it sometimes turns into a gimmick, such as in City of Life and Death or Flowers of War). Anyway a blog has a huge advantage over lists: you can depict, debate, and make connections beetween works. And even, of course, use lists when you feel like it! No I suppose they don’t all make combat intense movies. I wrote a post last year about how influential Saving Private Ryan is versus how good. The two other movies which came out the same year, The Thin Red Line and When Trumpets Fade are both superior in my opinion. That reminds me that I never wrote part 5 of my Thin Red Line series. The Thin Red Line versus Saving Private Ryan part, I really should. I haven’t seen City of Death yet. I’m always worried when I post lists like this as some people get really annoyed and aggressive when others don’t approve of their favourite movies but luckily this blog doesn’t often attract that type of reader. Even a list can generate discussions. As you know I really like Saving Private Ryan…but also don’t think it should be in number one and the lacks of foreign movies just not right! I think Grave of Fireflies should be in the list too as it shows that war didn’t only affect the countries being attacked but also the aggressor. But it’s good to see Downfall there. Braveheart at number 2 is really wrong. I didn’t think of Grave of the Fireflies but that’s so true. Braveheart is really wrong. I can see why SPR makes a top 10, not mine but I see why. Obviously, not only most voters have a very limited knowledge of both « old » and « foreign » (non-Hollywood) films, but moreover they are heavily influenced by mainstream media recent exposure – mostly TV I guess. This is why 9 out of the 10 best are from the last three decades, and why people, when thinking about pre-modern war epics, mention Braveheart and omit Ran. It’s actually a miracle that Battle of Algiers made it, considering. By the way, The Pianist is actually an European production, whereas El Cid (in Heckler spray’s list) is definitely Hollywood. The latter isn’t so bad if you’re an Anthony Mann fan like me, yet in the war film department Men in War is much better. I knew I overlooked a European production… It felt American. While I like German movies I must admit the are the closest to US productions than any other European productions (one of my pet theories is that Germans are closer to Americans than Brits despite the same accents … but that’s somewhat very off topic). Battle of Algiers is used my the US military as educational material, that may explain it. I started watching it and will again, this week maybe. I hope I’m up to it this time. I’m not sure it’s the influence of TV, I’ve read recently that especially US TV shows (The Wire etc) are much better than most of the movies. I’m sure the subtitles have a lot to do with the fact that older French and Italian movies for example are not much liked. Most of the time 50% of the subtitles are missing -Roma, Città Aperta and La grande illusion are two examples. When I mentioned media exposure on TV, I meant television re-screenings, advertising and shows dealing with cinema. I should have added the Web, since this is a list compiled by a web portal – oddly compiled I should say, as several war movies which do not appear in the list have better ratings on Yahoo! (and probably had already at the time the list was made) than many who actually do. The two David Lean movies, although produced by Sam Spiegel, were British productions, so I guess this makes the UK even with Germany here. Yet I find it unforgivable that not a single Russian nor Japanese film made the top 30. That’s what I said somewhere too. Even if we chose to compile a Top 20 US movies we could do better than this. There really are a lot of outstanding US movies, at least in my opinion and they are not on the list. It’s a very mainstream list. Shoah, a 1985 documentary, is actually the youngest picture in the top 50. The top 100 won’t be available until mid-August, however beyond a few items that were already in the 2002’s top 60 (Grand Illusion, Lawrence of Arabia,…), it seems that Claire Denis’ Beau Travail (1999) has been included. The directors’ rankings have not been published yet, but Apocalypse Now seems to make the top 10 there. I shared another list a while back and it looked very similar. It was a compilation of many lists and Apocalyspe Now and Battleship Potemkin were on it. I would never inlcude a documentary, I don’t think it can be compared. Thanks for putting it. I’m certainly going to search for a copy. Just to update these posting we need to add what are probably the best war films ever made for TV. `Band of Brothers’ and `Pacific’ are energetic serials made by the best in the business. They are as historically accurate as anything could be, they are flawlessly scripted, acted and the production values are beyond improvement. What else would you expect from a genius like Spielberg. I couldn’t agree more. They are excellent but for some reason people always only include cinema films. It’s too bad as there ares so excellent made for TV movies and mini-series, Band of Brothers and The Pacific being at the very top, yes.